The ‘Milo Massive’ (milo is the energy drink of champions and drank in copious amounts on our trip!) took on Kili with great gusto, huge doses of humour and buckets full of digging deep, buttercup style. We arrived in Tanzania with all bags and all people present and correct, a real bonus compared to my previous trip in January. After tucking into Tandoori chicken and chips plus copious amounts of water at Kaka’s, I did the trip briefing which always entails a lot of ‘do this’ and ‘don’t do that’ advice. Basically a health and safety fest with ‘drink X amount of water’ with everyone going ‘how on earth am I going to do that! A week or so before we departed the UK I had already advised the group to gradually cut down on the caffeine intake and to gradually up their water consumption but water consumption on the mountain is a whole different ball game! With bags packs, the weigh off completed, unnecessary toiletries and multiple packs of baby wipes plus Levison Wood extracted from various bags, we were good to go with a heady mix of nerves and excitement. This is what everyone had worked so hard for over the previous months. Plenty of training, reading, watching videos, researching and buying kit, soothing emails from the Helen and Marni and a few thoughts of ‘why am I doing this’ from my fab group, we packed up our bus and headed out on our 3 hour drive to the Londorossi Gate for a boxed lunch. We watched as our porters’ loads were weighed to the exact kilogram then headed a little higher to the start of our trek. The sun was shining and there was not a cloud in the sky, a great start to what was to be a great week. ‘Team MM’ were greeted at our first camp, Shira 1, by our incredible support crew. A team of 56 including our guides who sang their hearts out and danced like no-one was watching, encouraging the group to get involved. I am always keen for my clients to conserve energy on any expedition at altitude however a good old knees-up ‘Tanzanian stylie’ is good for the soul. We all settled into a routine set for the following 6 days on the mountain. Drink plenty, eat as much as you can, rest well, save energy, pee a lot, walk some and repeat. In the afternoon we sat outside the mess tent on our camping chairs chatting, laughing, jesting and enjoying the fact that sitting down and doing nothing is definitely allowed! A quick thunderstorm saw us running for shelter but we knew it would make our trek up higher the next day less dusty so no complaints were had. Getting up at 6am can be a challenge at the best of times but when it’s cold and you know you’ve got a 10 hour day ahead the challenge feels greater. However, sticking your head out of your tent to see the most incredible sunrise certainly spurs you on. We set off up to the Lava Tower which, at 4600m, was our highest point so far. Lunch at this altitude can be somewhat interesting with lack of appetites and the odd headache flying around. Unfortunately before arrived I had to make the hard decision to advise Gillian that she had reached her summit and that Moshi and more oxygen was the best option. It is always hard to tell someone this but safety – fun – summit is well known mountaineering mantra and safety always has to come first, no matter what. Roll forward to Barranco Wall day and there was an air of excitement amongst the group. This is very often our client’s favourite day but they don’t know this when setting out from camp. Seeing the wall rise up above them, steeply at first, heart rates certainly soar at the task ahead. We scrambled upwards, wending our way around the rocks and went ‘pole pole’ up the wall to be greeted at the top with clear views of Kibo above us and Mt Meru in the distance. Onwards to Karanga Camp we trekked to get in at lunchtime to fried chicken, chips and coleslaw. A very welcome treat and a standing ovation for our chefs. 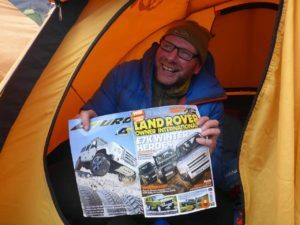 A good afternoon’s rest was had and for Darren a look through the classifieds in his LandRover magazine! Things start getting serious in people’s heads when you get to Karanga as summit night is a little over 24 hours away. I did a summit night chat, what to expect, trying to alleviate worries but you can never really explain just how hard it will be, everyone has a different scale and you don’t want to scare people off. Before leaving Karanga the next morning a good old rendition of ‘Happy Birthday’ was sung for Richard by our entire team. Spurred on by the jollities but saddened to know that Charlotte had reached her personal summit and was heading down to Millennium where we would catch her up in a day’s time. 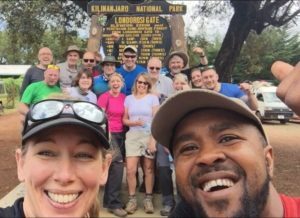 We cracked on higher and up to Barafu Camp with a brief stop along the way to turn off Simon’s electric shaver that had been buzzing in his porter’s ear for the past hour and had been ruining his reggae music! We arrived in good time at 4550m, just shy of our Lava Tower height, where a simple lunch was waiting for us and we then got our heads down for a pre summit afternoon nap. Barafu is a busy camp on a narrow strip of ridgeline where trekkers like us are heading up at all hours of the day and summiteers are heading down so there is good amount of action going on. An early tea followed by a recap summit briefing, the latest weather forecast and a good dose of ‘stay strong guys, you can do this’. Another sleep was in order and we were then woken at 11pm to get ready for our summit push. Nerves are always jangling on any summit night, whatever mountain you are climbing. ‘It’s just another day on the hill’ I say, ‘don’t let this become a monster in your heads’ followed by ‘just one foot in front of the other, one step more is one step less’. Easy for you to say I heard but remember, I did this mountain for the first time many years ago too and it’s words that I have used ever since. We set off at 12 midnight sharp and started up through camp. The wind was blowing as predicted but we plodded on at a good Kili crawl. Up the sticky rock slab, up the rocky zig zags, through Kosovo Camp to our first stop. Everyone seemed to be doing well but as we hit the longer, smoother zig zags the wind speed suddentdy went up a few notches and the temperature dropped a fair few degrees. Charley dropped back slightly as her hourly ‘snack reminder’ alarm went off and I stayed behind with her. She started to reach her personal summit and at 3am and 5200m it was time to call it a day. She had pushed through strongly but sometimes your body just says no despite you climbing by the altitude rules. A big hug and a safe travels back were said as we watched her and Chaji Boy, her summit porter, head down and back to camp. Trying to catch up with a group which has gone ahead is always a bit special on summit night. Good training I thought as Mussa shot off (with no pack on) and I headed up as fast as I could carrying a good few kilos of equipment in my pack. I caught up with the Milo Massive 25 minutes later and we all continued up higher, simply putting one foot in front of another. 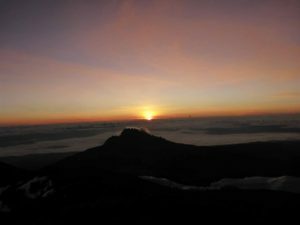 Sunrise, for me, is always a highlight on any summit attempt and on Kili it is always rather special. We plodded up to Stella Point, the crater rid, at a snails pace just as the sun started to rise behind Mt Mawenzi at 6am. 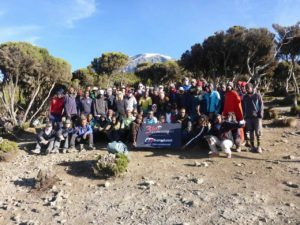 A beautiful bright red line appearing on the horizon behind you spurred my team on along with a good mug of hot sweet tea and with ‘only’ another 45 minutes to go around the crater rim to Uhuru Peak, we were set for an amazing summit. There were tears of joy at Stella Point and tears of wonder at Uhuru Peak. We had made it. 6.45am, Wednesday 15th February 2017. Fast forward a few hours and back down in Barafu I was greet by a smiley Charlie who had recovered well but told me that Chaji Boy had tripped over and face planted a rock. She had done a great patch up job on him but a bit of nasal first aid was in order, cleaning his cut and determining whether he had broken his nose. Although he was in pain he was certainly enjoying the attention! We arrived at Millennium at 1.30pm, the earliest I had ever arrived down at this more oxygenated and warmer camp. Charlotte greeted us with a big smile and it was great to have most of the team reunited. Fiona weras once again greeted by a heart felt note left in their tent by our waiter, Yahayah, his last of 7. Going the extra step is what our team does best. We were all looking forward to a good night’s sleep and to the beautiful trek down through the rainforest to Mweka Gate where Gillian and her husband were waiting for us. The popping of champagne corks and the fizz of soft drinks was drowned out by more singing and dancing and signaled the end of a truly special 7 days on the mountain. What a team! On the mountain we are one team. Me, our clients, our guides, our crew, big characters with great expectations. We are one family.